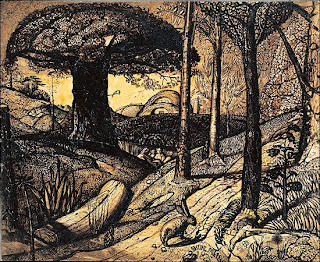 'Early morning'  by Samuel Palmer. Vivid, intense and extraordinary, Palmer's sepia ink landscape drawings are his attempt to describe the majesty of creation. There is a manner of visual description that he is developing here, a stylised language that is both naturalistic and abstracted. The treatment of organic form is systematic, creating a 'patchwork' of texture/pattern/line. Unpicking and rationalising the information, representing it in a semi-abstracted way, stylising but communicating.